Heart Boxes 1-1/2lb. to 5lb. Duerr Packaging is proud to present an expanded line of Heart Boxes with new, unique designs at competitive prices. Our state of the art heart box manufacturing machines will insure quality construction and increased productivity. Stunning graphics using four color process printing and foil hot stamping highlight these fresh, innovative Heart Boxes. 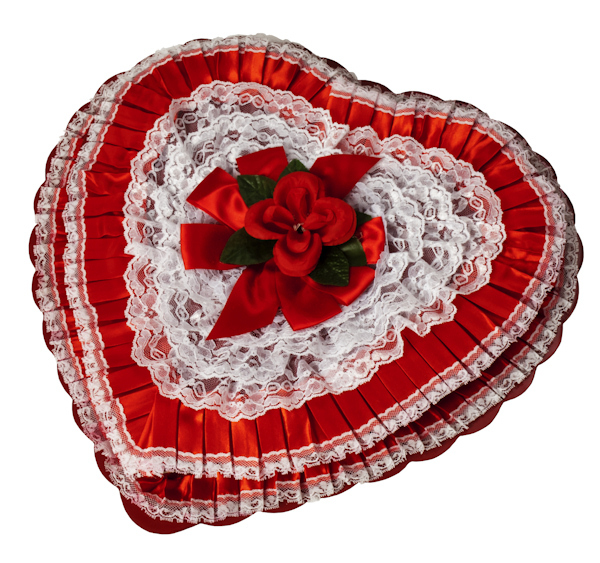 The package can be made complete with the addition of a plastic Heart Tray, Glassine Paper or Wattlyn Candy Pad. To ensure safe handling and easy gift wrapping, each 1/2 lb. through 5 lb. Heart Box is packed in a chipboard outer box. All Heart Boxes are packed in reasonable case quantities and with no large minimum order required, but only the quantity you need for the season at hand. For the ultimate Heart Box Design, why not set your Heart Boxes apart from the same old crowd by having us custom print your name on them? With minimums starting at 250 boxes, we can print your logo, box weight, ingredients and nutritional information on your custom heart boxes. Please look to Duerr Packaging for affordable Valentine’s Day packaging ideas with the versatility and classic elegance to elevate your chocolates from the same old crowd. 3 lb. Lace with Rose Platform Red lid with a red fabric rose, white lace and pleated red ribbon with white lace. Platform base with pleated red ribbon. Wattlyn candy pad and paperboard dividers included. 5 lb. Lace with Rose Platform Red satin with red fabric roses, red satin ribbon gold strand. Platform base with pleated red ribbon with white lace and gold ricrac. Wattlyn candy pad and paperboard dividers included. Copyright © 2009 - 2019 Duerr Packaging.